Marking a milestone in RR'ing high and wide loads! 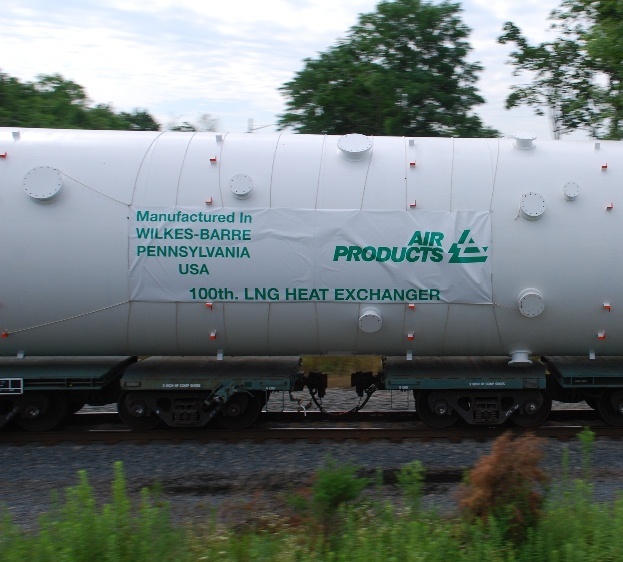 Sunday (July 22nd) morning's move of an Air Products heat exchanger represented the 100th LNG heat exchanger manufactured by Air Products. To commemorate this milestone, Air Products hung a banner to proclaim the significance of this particularly heat exchanger. Its eventual destination will be the "land down under", Australia. NS 3007 (EMD GP40-2; ex-CR 3285) is the leader as it passes by the ex-Reading station in Belle Mead, NJ at MP 50 on the CSX's Trenton Line. One can only imagine the planning and logistics that went into that very first move of a heat exchanger. · Railway operating revenues were $2.9 billion. · Income from operations improved 7 percent to $934 million. · Diluted earnings per share increased 3 percent to $1.60. · Railway operating ratio improved 2 percentage points to 67.5 percent. NORFOLK, VA. – For the second quarter of 2012, Norfolk Southern reported net income of $524 million, 6 percent lower than $557 million for the second quarter 2011. Diluted earnings per share were an all-time record $1.60, up 3 percent compared with $1.56 per diluted share in the same period last year. Second-quarter 2011 net income included favorable, non-recurring income tax-related benefits totaling $63 million or $0.18 per diluted share. Railway operating revenues of $2.9 billion were essentially flat in the second quarter compared to 2011. General merchandise revenues improved 9 percent to $1.6 billion. Coal revenues declined 15 percent to $755 million. Intermodal revenues improved 4 percent to $563 million. Railway operating expenses for the second quarter fell 3 percent to $1.9 billion, compared with 2011. Income from railway operations for the second quarter was $934 million, up 7 percent compared with the same period last year. The second-quarter railway operating ratio improved 2 percentage points to an all-time record 67.5 percent, compared with 2011. How ironic: In July, 2012, NS has a vintage, four-unit, streamlined EMD passenger locomotive set painted in an adaptation of the freight color scheme worn by hood units of one of its predecessors (SOU)...and at least four brand-spanking new freight hood units painted in the passenger locomotive schemes worn by vintage, streamlined EMD's of four of its predecessor roads (PRR, ERIE, DL&W and SOU)! A half-decade ago, who would ~ever~ have predicted THAT outcome for mid-2012, back when NS was 'just' a quarter-century old? Recieved a last minute notice that John Kilbride will be presenting a lecture on the Camden & Amboy RR at the Readington Museum at 7:00 o'clock this evening. $5.00 suggested donation for adults, refreshments served. NORFOLK, VA. – The Norfolk Southern Foundation is committing $50,000 in emergency funding to the American Red Cross of West Virginia. The funding will help West Virginians in their recovery from the tornado-like storms of June 29 that resulted in food shortages, power and water outages, and damage to critical infrastructure. Power outages were especially devastating, as some one million homes and business in the state were without electricity during a heat wave. Following article is from railjournal.com. THE project to automate Paris Metro Line 1 reached an important milestone on July 7 with the launch of full Unattended Train Operation (UTO) at weekends. Paris Transport Authority (RATP) has been operating Line 1 in mixed mode with both UTO and semi-automatic train operation (STO) since last November, and the number of UTO-equipped trains in service has increased steadily in the first half of this year. RATP says more than 60% of services are now driverless, and on May 21 full UTO operation was introduced after 21.00 on weekdays. The transition to UTO will be completed at the end of the year. New driverless MP05 trains from Alstom are entering service at a rate of two per month, and 28 of the 55 trains ordered by RATP are now in service. The fleet is gradually replacing the MP89 sets, 27 of which remain in operation on Line 1. These trains are gradually being cascaded to lines 4 and 11 as more MP05s are commissioned. Line 1 is the oldest and busiest metro line in Paris, carrying around 750,000 passengers per day. Siemens was awarded a €30.8m contract in 2005 to upgrade the PA BF speed-code automatic train control system to CBTC using its Trainguard MT technology and Airlink free-propagation radio communication system. Siemens also provided onboard equipment and the new control centre, which was commissioned in May 2010. The existing relay-based interlockings were replaced with Thales LockTrac modular computer-based interlockings. The introduction of CBTC has means headways will be reduced from 105 seconds to 85 seconds. Together with the introduction of new trains, this will boost capacity from 24,000 passengers per hour per direction in 2008 to 30,000 by the end of this year. A full description of the project can be found in the July 2010 issue of IRJ (p30). NILES, Ohio - July 13, 2012 - CSX Corporation (NYSE: CSX) today hosted a dedication ceremony for the new Fifth Street Bridge in Niles, Ohio. The upgraded bridge's higher vertical clearance helps clear the way for CSX's upgraded, double-stack freight rail corridor linking East Coast sea ports with the CSX Northwest Ohio Terminal and other Midwest distribution and manufacturing hubs. The $1.4 million composite steel bridge was paid for through a combination of funds from the American Recovery and Reinvestment Act and CSX. It is one of the first fully completed clearance projects in Ohio being undertaken as part of the National Gateway, an approximately $850 million infrastructure public-private partnership. "The Fifth Street Bridge is a perfect example of local economic growth driven by private and public investment in our nation's infrastructure," said Mayor Ralph Infante, Jr. of Niles, Ohio. "This new, modern bridge is a welcome addition to our community and an exciting symbol of the future of the American freight transportation investments needed to keep communities such as ours positioned to compete domestically and internationally." The bridge is one of a number of clearances that will allow double-stack freight rail access to CSX's new Northwest Ohio Terminal, a 185-acre world-class freight distribution hub and the nerve center of CSX's nationwide intermodal network. Located near North Baltimore, Ohio, the new facility employs more than 200 full-time employees and serves as the transfer point for hundreds of thousands of freight containers annually. "We are pleased to recognize the continued progress of the National Gateway," said Louis Renjel, vice president of strategic infrastructure initiatives, CSX. "Along with other planned investments, the new Fifth Street Bridge will help prepare CSX and the state of Ohio to meet increasing freight transportation demands and to enhance the flow of goods throughout the nation." National Gateway improvement projects will increase the vertical clearances at 61 locations on CSX rail lines in the region to accommodate intermodal trains carrying double-stack intermodal containers. To-date, 14 locations including the Fifth Street Bridge have been cleared on the existing CSX rail corridor between North Baltimore, Ohio and Chambersburg, Pa., keeping Phase One of the project on track for Spring 2013 completion. One of the nation's largest transportation projects, the National Gateway will create more than 50,000 jobs over a 30 year period by increasing the amount of freight that can be transported on a single train. When completed, the National Gateway will provide more than $10 billion in public benefits in the route's first 30 years of operations by decreasing fuel consumption, lowering emissions, improving safety, reducing highway maintenance costs and saving shipping costs. To learn more about the National Gateway, visit http://www.nationalgateway.org/. CSX Corporation, based in Jacksonville, Fla., is one of the nation's leading transportation companies, providing rail, intermodal and rail-to-truck transload services. CSX's network spans approximately 21,000 miles, with service to 23 eastern states, the District of Columbia and two Canadian provinces. CSX's network connects more than 240 short line railroads and more than 70 ocean, river, and lake ports. More information about CSX Corporation and its subsidiaries is available at http://www.csx.com/. Like us on Facebook (http://www.facebook.com/OfficialCSX) and follow us on Twitter (http://twitter.com/CSX). Limited to store stock. Does not include special orders. Stop in to see what is available. You just might find something you need. Following article is from CNN.com. Washington (CNN) -- Facing an aging rail industry workforce and an influx of returning military veterans, the U.S. Department of Transportation announced Tuesday an initiative in which the growing rail sector will hire more than 5,000 veterans this year, matching the same number hired in 2011. "Our veterans have skills and real life experiences that we need to help rebuild America," said DOT Secretary Ray LaHood during a conference call with reporters on Tuesday. LaHood said veterans are valuable potential employees because of their prior training in the military. He pointed out military personnel have leadership and teamwork training and experience working with heavy machinery in demanding work conditions. From the military to the NBA Potential industry jobs include operating locomotives, signal maintenance and telecommunications in both freight and passenger rail. "Today, roughly 23 percent of the railroad workforce is eligible to retire by 2015," said Ed Hamberger, president of the Association of American Railroads, an industry trade group. The railroad industry is offering veterans jobs because its business is growing and new jobs will soon open up as more people start to retire, he added. The railroad association is working with the Department of Veteran Affairs to make sure that 500 railroad companies -- including freight, inter-city passenger and commuter railroads -- are committed to offering military servicemen and women jobs. "The railway industry clearly recognizes that hiring veterans is good for their companies, bottom line, and we are appreciative of their efforts to serve veterans as well as they have served the country," said Brad Cooper, executive director of Joining Forces, a White House initiative to provide opportunities and support to service members and their families. Some 1,600 companies have hired more than 90,000 veterans and military spouses in the past year. These same companies have committed to hiring 170,000 in the coming years. The rail industry initiative was launched last year by first lady Michelle Obama and Jill Biden, wife of Vice President Joe Biden. Last month, LaHood and Veterans Affairs Secretary Eric Shinseki announced a new portal on the VA website that will help veterans find jobs in the transportation industry. "We are proud to offer our heroes transitioning from military service the opportunity for another career in service to our country," Hamberger said. It's a "great mesh of their characteristics and leadership learned in the armed forces. It's a win-win." Currently, more 15,000 veterans work for the Department of Transportation, including 3,000 with disabilities. JACKSONVILLE, Fla. - July 10, 2012 - CSX Corporation (NYSE: CSX) is nearly halfway to meeting its pledge to hire approximately 1,000 veterans this year, joining other railroads and rail suppliers in support of the White House Joining Forces initiative. Joining Forces is a national partnership organized by First Lady Michelle Obama and Dr. Jill Biden to support America's military service members and their families. "We are honored to join the nation's railroads in recognizing the contributions of our veterans and continuing to offer them fulfilling career opportunities," said Lisa Mancini, senior vice president and chief administrative officer, CSX. "The nearly one in five current CSX employees who are active or former service members bring unique skills, accountability and teamwork to their jobs, helping our railroads operate safely and efficiently." CSX's announcement coincides with an industry-wide commitment, led by the American Association of Railroads (AAR), to hire more than 5,000 veterans in 2012. AAR president and CEO Edward R. Hamberger, U.S. Secretary of Transportation Ray LaHood and White House Joining Forces executive director Captain Bradley Cooper emphasized at a press conference today that the nation's rail industry is well-positioned to provide career opportunities for men and women transitioning from active duty. "The commitment from AAR and companies in the railway industry to veteran hiring is exactly the type of effort we hoped to see when the First Lady and Dr. Biden launched Joining Forces last year - companies stepping up to hire our nation's veterans," Cooper said. "The railway industry clearly recognizes that hiring veterans is good for their companies' bottom line and we are appreciative of their efforts to serve veterans as well as they have served this country." CSX's long-standing commitment to supporting military service members has been recognized by numerous organizations, most recently by CivilianJobs.com as the Most Valuable Employer for Military. CSX is the only two-time recipient of the Secretary of Defense Employer Support Freedom Award, and is regularly ranked among the top three companies on G.I. Jobs magazine's Top 100 Military Friendly Employers list. The company supports employees who are National Guard or Reserve members by extending salary and benefits to employees called up to active duty. In addition, CSX serves more military facilities than any other major U.S. railroad, handling thousands of carloads annually for overseas deployments and training exercises. For more information about Joining Forces, visit http://www.whitehouse.gov/joiningforces. JACKSONVILLE, Fla., July 11, 2012 - Earlier today, the Board of Directors of CSX Corporation (NYSE: CSX) approved a $0.14 per share quarterly cash dividend on the company's common stock. The dividend is payable on September 14, 2012, to shareholders of record at the close of business on August 31, 2012. CSX Invests in Safety, Service by Completing $34 million Maintenance "Jamboree"
JACKSONVILLE, Fla. - July 11, 2012 - Doing a year's worth of work in one week may sound like a challenge. Then throw in record heat and rugged terrain. None of that deterred the more than 900 CSX employees who worked safely and successfully to complete the company's 2012 Maintenance "Jamboree" on a section of our network in the Southeast earlier this month. The "Jamboree," an annual event, compresses about a year's worth of track, signal and bridge maintenance and upgrades into roughly one week, reducing the impact on customers and communities. "This critical work helps fulfill our commitment to investing in our customers and in the communities in which we operate," said Oscar Munoz, executive vice president and chief operating officer. "Our engineering forces are the best in the business, working safely to ensure that these lines are safe for our employees, in good repair to keep our customers' freight moving, and allow American businesses to compete in the global economy." This year the company completed nearly $34 million of work during the "Jamboree," including maintenance and repair of tracks, signals and bridges in Kentucky, Virginia, Tennessee, North Carolina and South Carolina. These projects promote train safety, reliability and service, and benefit customers across CSX's network. They also help communities by getting all the necessary work done to maintain smooth crossings where roads and highways pass over the tracks. This work, focused on key routes between Shelby, Ky., and Abbeville, S.C.; and from Bostic, N.C. and Elmwood Junction, S.C. to Newberry, S.C., is part of CSX's overall maintenance program and the company's commitment to invest $2.25 billion in its network infrastructure this year. CSX crews completed the work on the July Fourth holiday, replacing or installing nearly 176,000 cross ties, 2,500 railcars of rock ballast, and 233,000 feet of mainline rail. The crews also installed an additional 59,000 feet of relay rail in the company's Erwin, Tennessee, yard, repaired or refurbished ten bridges and 255 road crossings, and completed nearly 650 track welds. NEW ORLEANS, La. - July 9, 2012 - CSX Corporation (NYSE: CSX), the U.S. Environmental Protection Agency and the Regional Planning Commission (RPC) for the New Orleans metropolitan area are contributing to better air quality in Louisiana through a jointly funded GenSet ultra-low emission locomotive. Housed at CSX's Gentilly Yard in New Orleans, the GenSet uses technology that reduces carbon emissions by 25 percent and nitrous oxide and particulate matter by more than 80 percent. "This joint effort is a great example of public and private organizations working together to serve our communities," said Carl Gerhardstein, assistant vice president, environmental systems and sustainability, CSX. "CSX is committed to environmental stewardship, and this locomotive will contribute to our newly announced goal to reduce the company's greenhouse gas emissions intensity by 6 to 8 percent by 2020. That, in turn, helps to improve air quality in the communities we serve." GenSet technology was incorporated in the retrofit of an existing locomotive used for switching rail cars at Gentilly Yard. The retrofit process replaces the traditional large, single diesel engine with three small diesel engines, allowing the locomotive to use only the energy it needs to pull its load. Monitoring technology takes the engines into "sleep" mode after a period of inactivity to conserve fuel and reduce emissions. The GenSet retrofitting process was partially funded through a grant awarded to the Regional Planning Commission (RPC) by the U.S. Environmental Protection Agency's National Clean Diesel Funding Assistance Program as part of the 2005 Diesel Emission Reduction Act (DERA). CSX funded the remainder of the retrofit as part of the company's commitment to fuel efficiency and emissions reduction. "Continuing to invest in sustainable technology is critical as we continue to rebuild the city of New Orleans," said Rebecca Otte, RPC's Southeast Louisiana Clean Fuel Partnership Coordinator. "Supporting this initiative with CSX will improve air quality in our region and in turn serve the people of the New Orleans metropolitan area." The Gentilly locomotive is one of three recently completed DERA-funded GenSets, and one of more than 30 GenSets in operation on CSX's network overall. Over the past decade, CSX has invested more than $1.75 billion to upgrade its locomotive fleet, helping the company to improve fuel efficiency by 90 percent since 1980. In 2011, CSX was the only railroad named to the Carbon Performance Leadership Index by the not-for-profit Carbon Disclosure Project. 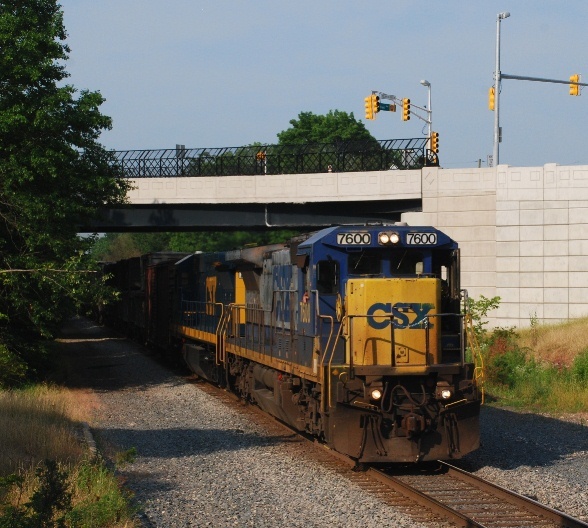 More information about CSX's environmental commitment is available on the company's web site http://www.csx.com/. The Regional Planning Commission (RPC) for Jefferson, Orleans, Plaquemines, St. Bernard and St. Tammany Parishes, is a 26-member board of local elected officials and citizen members. This board is supported by a staff of 22 professionals with broad experience and education, in a variety of areas including urban and regional planning, community development, economics, engineering, government, history, law, landscape architecture, political science, sustainable development, transportation, geography and other disciplines. The Southeast Louisiana Clean Fuel Partnership, housed at the RPC, is a U.S. Department of Energy-designated Clean Cities Coalition that brings together stakeholders in the public and private sectors to deploy alternative and renewable fuels, idle-reduction measures, fuel economy improvements, and emerging transportation technologies. For more information on the Clean Fuel Partnership visit: cleanfuelpartnership.org. For additional information on the Clean Cities program, visit: http://www1.eere.energy.gov/cleancities/. Before it got too hot here in NJ! I decided that getting up early on Saturday morning and trying to beat the forecasted temperature of 100 degrees was the only way to go on being trackside. My first stop would be Belle Mead (Trenton Line; MP 50) where there was some token relief from the sun provided by the shade trees. It wasn't much of a respite but it was better than standing out in the sun! Around 8:30, CSX 7600 and 7636 would bring its short consist of mixed freight east along with a breeze generated by its passing cars. From there I was headed over to NS's LEHL in Three Bridges (MP 48). After a twenty minute wait, the signal changed to indicate a eastbound train would be coming soon. It wasn't long before NS 212's headlight was seen in the distance approaching my location. After 212 passed, the heat and gnats were proving to be the deciding factors to call it a day for this trip. Caboose Trains To Three Bridges! 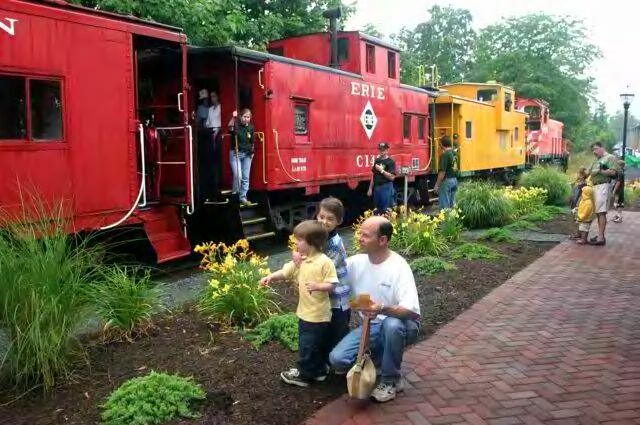 Every Saturday this July we are operating caboose trains to Three Bridges. This is a very rare opportunity to ride a train made up entirely of cabooses all the way from Ringoes to Three Bridges and back! On July 7, 14, 21, and 28, the caboose train will depart Ringoes Station at 6:30 PM for one round-trip to Three Bridges. Tickets are by reservation only, and seating is very limited. Seats are $15 per person (lap riders under age 3 ride free, no ticket required). PS: Visit our website for information about more special events with tickets currently on sale, including Three Bridges Excursions, Photo Freights, the Eerie Limited, and the North Pole Express! For information on upcoming trains and events Visit Our Website. 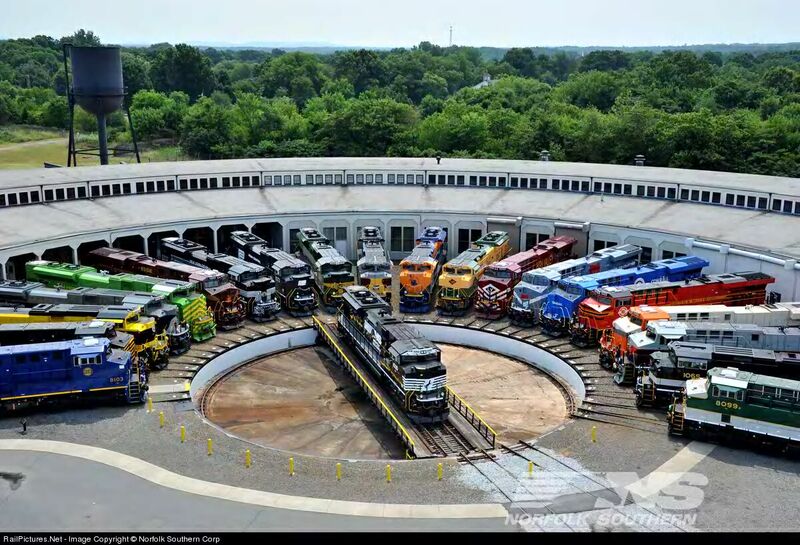 July 7, 14, 21, 28 Ride a train made up entirely of cabooses all the way from Ringoes to Three Bridges and back. Reservations required. 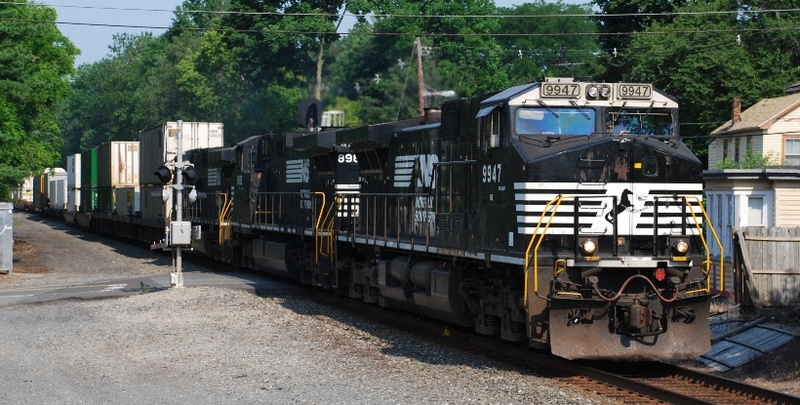 NORFOLK, VA. – Norfolk Southern Corporation will present its second-quarter 2012 earnings on Tuesday, July 24, 2012, at 4:30 p.m. EDT via teleconference and live Internet webcast. The company will issue its earnings results shortly after market close on July 24. Those interested in participating via teleconference may dial 877-869-3847 several minutes prior to the call. An audio replay will be available until July 31, 2012, following the live broadcast, by dialing 877-660-6853, using PIN 2861, and replay number 397173. In conjunction with the call, a live webcast will be accessible, and presentation materials will be posted at http://www.nscorp.com/ under the Investors section. Following the earnings call, an Internet replay of the presentation will be archived on the company's website. In addition, the replay will be available for download to a portable audio player or computer as an MP3 - or podcast - file. Both the replay and MP3 file can be found on the website in the Investors section. Following web site tracks movement of heritage locomotives for Amtrak, Union Pacific, and Norfolk Southern. NORFOLK, VA – Norfolk Southern Corporation (NYSE: NSC) has released an upgrade to its mobile app featuring the ability to track and report sightings of the company’s 30th anniversary heritage locomotive fleet and to report safety issues to company police. The latest version of the NS Corp app originally released last August now is available for iPhone, with a version for Droid phones to be available later. New buttons “Heritage” and “Protect NS” enhance the connection between users and the railroad. “Heritage” gives users the ability to see where the NS heritage locomotives have been spotted and to report and post photographs of new sightings. To help celebrate its 30th anniversary this year, NS painted 20 new locomotives in the color schemes of some of its most prominent railroad predecessors. 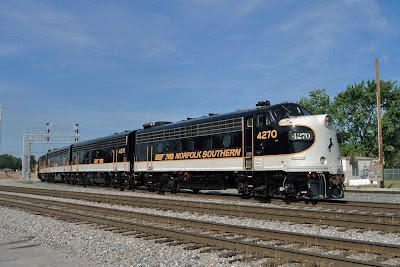 Release of the app upgrade coincides with a display of all 20 heritage locomotives July 3 and 4 at the North Carolina Transportation Museum at Spencer, N.C., after which the locomotives will return to freight service. “Protect NS” enables reporting of safety issues on NS lines and the option of contacting NS police directly. 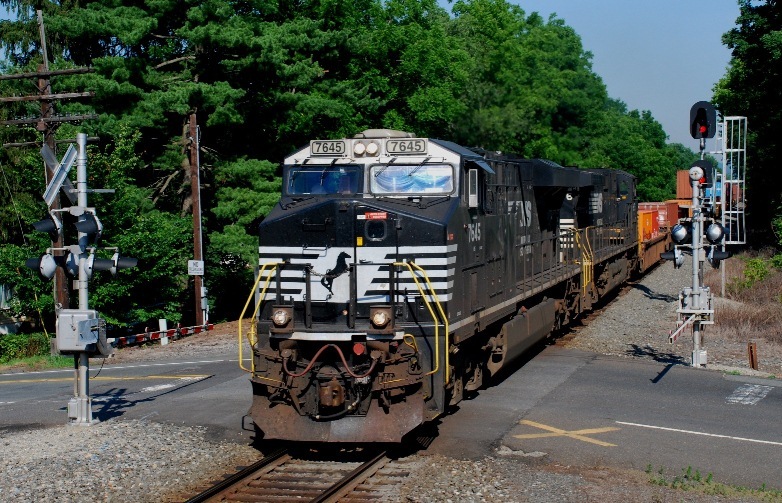 It is a mobile extension of Norfolk Southern’s “Protect the Line” program launched in May whereby observers can report equipment maintenance issues, track obstructions, trespassing, vandalism, suspicious activity, and terrorism. The upgraded version retains the original app’s functions. An enhanced, smoother moving time line highlights milestones reaching back to Norfolk Southern’s roots in the 1820s. A “News” button gives users a choice of company news releases and real-time feeds of the NS Facebook and Twitter pages. “Stock” provides the latest available NS stock price and related industry financial news. “Gallery” offers photos and videos of locomotives, people, commodities, and scenery. In “Trivia,” users can test their rail knowledge. The NS system map and other general company information are found under “About Us,” and “Contact Us” gives key NS telephone numbers. 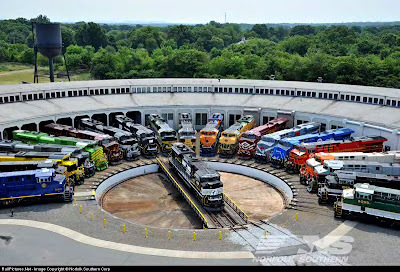 Here is a link to a local (Salisbury, NC) newspaper article about the display of the NS heritage locomotives at the NC Transportation Museum on July 3rd and 4th. ... as the waiting along the Lehigh Line was proving to be challenge to wait it out under the shade of a few trees or head back home to the cool confines of an air-conditioned house. It wasn't that hot as NS 21M passed by Three Bridges with its consist of COFCs at 8:47. Another fifteen minutes would pass before the sound of NS 22V's horn blowing for its approach to the Rockafellow Mills grade crossing was heard. Leading this intermodal's colorful consist of COFCs was NS 7645 and NS 8976. After 22V's passage, the heat and humidity had sufficiently wilted me enough to call it a day! JACKSONVILLE, Fla. - July 3, 2012 - As the Fourth of July holiday approaches and summer travel continues, CSX Corporation (NYSE: CSX) and its employees remind neighbors, pedestrians and motorists to stay away from railroad tracks and to use caution at grade crossings. According to the Federal Railroad Administration, 427 people died in 2011 while trespassing on rail property. These tragedies could be avoided, and CSX conducts public safety outreach to raise awareness of potential hazards on tracks and at crossings. "The summer months are a time to reconnect with family and friends, but we also see more people trespassing or taking unnecessary risks at crossings," said Cliff Stayton, Community Affairs and Safety director, CSX. "We encourage everyone to use common sense, never underestimate the dangers of trespassing, and to be alert while near railroad tracks."
. Never trespass on railroad property. It's illegal and dangerous. CSX supports Operation Lifesaver, a national program that reaches more than one million people per year with safety messages. In addition, CSX joined forces with a NASCAR race team and NCAA college basketball teams to promote the company's "Play it Safe" campaign. The campaign, which also uses billboards and online outreach, is a key program to reach males ages 18-34 years old and those most likely to be involved in crossing or trespass incidents. For more information on safe rail practices and CSX's commitment to serving the communities in which it operates, please visit http://www.beyondourrails.org/. Folks- they are lined up by families. On the left- the IT, WAB, VGN and NKP were merged into the N&W. Going clickwise- the PRR and NYC formed the PC, which then with the Erie, Lackawanna, CNJ, RDG, LV (even kept the anthracite roads together), and Monongehela into Conrail. And the original NS, INT, CG, S&A into the Southern. A very knowledgeable and historic lineup. Bravo, NS! Note: to see any photo on this blog at full size, simply click on the photo. Then, user your browser's BACK button to return to the blog. Also see our numerous posts over the past couple of months about the NS heritage locomotive program. Finally, I think the RDG and LV units should have been swapped. Received the following via email from Richmond Bates. Text and photo are his. 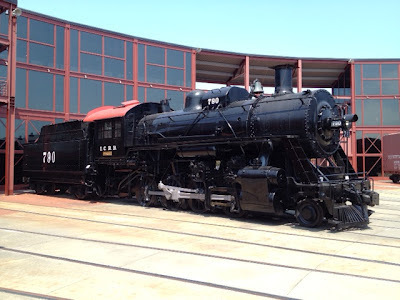 Steamtown recently completed the cosmetic restoration of Illinois Central 2-8-0 #790. Steamtown has used federal stimulus money to remove asbestos and cosmetically restore a number of its locomotives. IC #790 is the first of these to be completed. IC #790 was built by Alco in 1903 and is the oldest locomotive in the Steamtown collection.